Description: An affordable and effective skincare tool for exfoliating and cleansing skin. According to Sigma , there are two main advantages to buying this product over the competition: the rotating brush heads and the price! The specially designed brush heads rotate to fully cleanse and exfoliate your skin, leaving it flawless. For only $39, you will receive the cleansing tool, a storage case, and three unique brush heads! That is about a fourth of the cost for similar products on the market! Say goodbye to dull and uneven skin! With the new Sigma Beauty Cleansing and Polishing Tool you can polish your skin to be perfectly smooth and flawless before and after your makeup application. 1. Add a small amount of your favorite facial cleaner directly to the brush head prior to application. Use the medium or firm brush head once a week to exfoliate dead skin cells and expose a fresh healthy layer of skin. 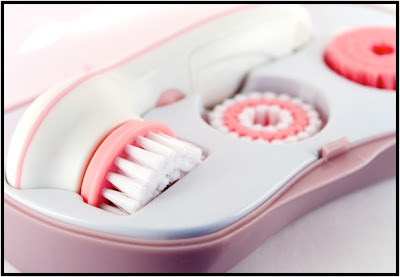 If you have sensitive skin, use the softest brush head at all times. Keep your entire exfoliation process under one minute. 2. Use the soft brush head for daily polishing. This should be a quick process kept under one minute to lightly remove dead skin cells prior to makeup application. 3. Once your skin is exfoliated and polished, proceed with the application of your favorite moisturizer and makeup. You will notice that the polishing process will help your moisturizer deeply penetrate your skin, which will create the perfect base for flawless makeup application! 4. Adjust this routine as needed. Once you get started, you can customize the intervals between exfoliation and polishing to fit your needs and your skin type. Moderation is key! Now is the time to get back to natural skin by efficiently removing all makeup residues from your skin! 1. Always use the softest brush head during the cleansing process. 2. Remove excess makeup prior to cleansing with facial wipes containing makeup remover. 3. Add a small amount of your favorite facial cleanser to the softest brush head and gently work it onto your skin using the Sigma Beauty Cleansing and Polishing Tool. Keep your cleansing process under one minute. 4. Apply your favorite moisturizer and you're ready for your beauty sleep! Try to use this tool in the shower- it can get a little messy with water spraying everywhere for the first few seconds when you turn it on, or go around a curve like your nose. It is also recommend to start off slow- your skin will develop a tolerance and become stronger and more resilient over time. Everyone should use the SOFT brush head first, just to get a feel for the tool and the intensity of the exfoliation…you don’t want to hurt yourself or damage your skin by starting off too strong. Always keep your cleansing or polishing routine under one minute- and let the tool do the work. The rotating brush head has two speeds so all you have to do is glide it gently over your skin. Product [25/25] – Works like a charm- does exactly what it says. Leaves skin feeling soft, smooth and clean in under 1 minute! Fully customizable too- bonus! Value [10/10] – At $39, you can’t go wrong…especially since it beats out $100+ tools! Use [4/5] – Super easy to use, but can make a bit of a mess if you aren’t careful. Accessibility [5/5] – Sigma ships worldwide- totally awesome! Packaging [5/5] – Absolutely gorgeous packaging…sleek, cute and pretty. A vanity decoration alone! A must have for all women (and men!) who want to keep their skin smooth & healthy! I love the fact their are multiple brush heads, speeds and its totally adorable too. Hope you are convinced! Get it now before it goes out of stock, because it definitely will!